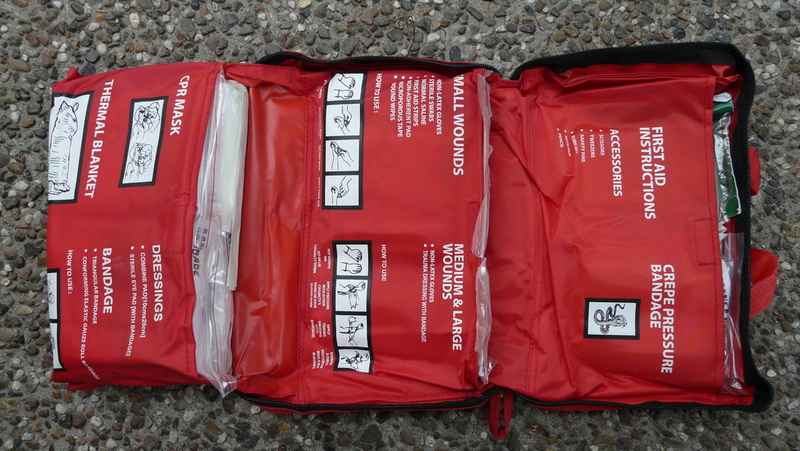 Today there is a great variety of commercial first aid kits available. But the best first aid kits are formed by thinking carefully about personal needs, activity, climate and the environment in which it will be used. An appropriate first aid kit for a solo 2 hour fishing trip in Sydney harbour would surely look different to one for 10 people on a several-day long Cape York 4x4 expedition, or a kayek expedition to a deserted pacific atoll. Below are some pointers that may help to guide you though the process of making your own personalised first aid kit. It's all about customising the kit to your particular needs. Depending on what those needs are, your kit might be not much larger than a packet of cigarettes, or may otherwise fill a shoebox-sized waterproof container. Remember though - owning a First Aid kit and not knowing how to use it's contents isn't a good combination, so for best results, go forth and do a first aid course ASAP (especially if your requirements dictate a more expansive kit). Small kit for an overnighter hike with the family, medium kit for extended Kayak trips (up to2 weeks/4 people, semi remote) and a full kit for extendet trips in very remote areas. Get some clear resealable bags to organise items into categories like: trauma, wound management, blister kit, burn kit, snake bite, topical medications, over-the-counter medications, and prescription medications. I have worked for many years as a paramedic and I can tell you how important it is to organise your kit well. When something goes wrong you really don't want to spend time searching for things in your First Aid kit. The resealable bags keep the contents of the different categories together, are pretty well waterproof and are transparent, allowing you to see what's contained inside. Well marked comercial First Aid Kit. 5: Think about personal heath problems, e.g. allergies (adrenaline auto injector), diabetes, heart conditions, asthma, motion sickness, and take the appropriate treatment out with you. 8: Think about the particular dangers/hazards of your trip, that may require special medications, immunisations or supplies: cold or hot climates, insects or parasites, snakes, poisonous plants, malaria regions, young children, or long expeditions. For example: does it pay to bring a small bottle of vinegar in a box-jellyfish area? Don't forget things like sunscreen and insect repellent. (You may choose to pack these separate, not as part of the first aid kit.) Another thing to consider for long distance trips would be tooth cement for temporary fillings if yours have fallen out. 10: Get a doctor to prescribe you some broad spectrum antibiotics. They'll treat the following infections: skin, urinary tract, gastro-intestinal, sinus, ear, eye, respiratory and soft tissue. Stick to tablets instead of liquids when ever you can. Tablets are lighter and easier to store, don't require refridgeration, can't freeze solid or leak, and normally have a longer shelf life than liquids. Another advantage is that tablets are packed individually & waterproof, and stay usable even if the surrounding package gets wet. 13: Pack a good emergency first aid manual, and have a list with the appropriate local emergency numbers.. Pack the resealable bags in a waterproof container, a roll-up bag, box or a hard case. Store your first aid kit in moderate conditions and store it easily accessible. Don't allow it to bake in the back of the car, or mistreat it in other ways, and it will last you a long time. Check regularly for use by dates, and replace items after they run out. Let others in your group know where you store your first aid kit in the kayak, so that they are able to find it if necessary. Take your first aid kit out with you, every time you go! Remember the old rule: You will only need a first aid kit, if you don't have one!